Started in 1827 by M. Rocher, the jewelry house of Mauboussin changed hands several times before it reached George Mauboussin, from whom it now takes its name. In 1869, M. Rocher left the company to Jean Baptiste Noury, his former partner and George’s uncle. By 1850, Noury had taken over the firm. The House, then called Maison de Noury, established itself as a fine jewelry house, exhibiting in Vienna in the 1873 World Expo and the 1879 Paris World Expo. It was not until George Mauboussin took charge of the company, in 1896, that Mauboussin began to reach its heights as one of the leading jewelry houses in Paris. George Mauboussin began his apprenticeship at the house in 1876, at the young age of 14. It was not unusual for people to begin learning a trade at such an early age, and as the future successor of Noury, a thorough education in his craft was especially necessary. In 1923, George moved the business to a much larger space closer to the Opera, on rue du Choiseuil, the chic center of Parisian commerce and affairs. This was a huge space, large enough to execute every aspect of the work from design to diamond and stone cutting, setting and polishing. There was a large and luxurious salon on the ground floor, and between 1928 and 1931, they held three themed exhibitions — Rubies, Emeralds and diamonds. These exhibitions brought them enormous amount of publicity, as well as many very important clients. They also acquired many important stones, which attracted the attention of European and Eastern royalty, and also such Hollywood stars as Marlene Deitrich and Greta Garbo. Mauboussin won many awards in the 1920’s. They exhibited at many of the important International Expositions in Europe and in the U.S. For their exhibition at the 1925 Esposition des Arts Decoratifs in Paris, Mauboussin was awarded the Legion of Honor, and the Grand Prize for their designs and creations, which boasted legibility of design, clear bold lines and a proclivity towards geometric patterns. Following the success of these expositions, the house expanded its operations, taking two new family members into the business – George’s son, Pierre Mauboussin, and Marcel Goulet, another nephew of Jean Baptiste Noury. They also began expansion into the England and the United States. The house was quick to respond to trends in taste, and they excelled at producing sumptuous Art Deco jewelry. In addition to precious stones, they also used coral, Mother-of-pearl, lapis and jade, much as their competitors were doing. These strong colors had been introduced into French design by the exotic Ballets Russes, when they performed in Paris. Soon Mauboussin’s jewelry became extremely popular with the “garçonne” or flapper of the 1920’s. The pieces created in the 1920’s began the house’s Art Deco traditions and established them as among the great jewelry houses of Paris, which would continue through the next twenty years. The Great Depression of the 1930’s caused the closing of many offices of Mauboussin overseas, and ended the involvement of Pierre Mauboussin, who went on to pursue his other passion, the creation of airplanes. The Paris house managed to survive, in part due to the patronage of Queen Nazli of Egypt and the Maharajah of Indore. Mauboussin was their chosen jeweler to mount the many stones within their collections, and their wealth supported the house through the difficult times. In order to survive the difficult war years, Mauboussin’s branches in Buenos Aires, Rio de Janeiro and New York entered into an agreement with Trabert & Hoeffer, important jewelers who had branches in other parts of the U.S., most notably in Chicago. This was in 1936, and the timing, unfortunately was against them. Mauboussin was eventually forced to sell their stock and the right to use their name to Trabert & Hoeffer. The jewelry produced from this union was signed Trabert & HoefferInc. – Mauboussin, and lasted until 1953. During this time, they came up with a very clever line of jewelry called “Reflections”. Individual decorative elements were created, and the client could choose the ones she liked, and create a unique and customized piece of jewelry. By 1953, this relationship had ended. Mauboussin’s style most characteristic of the 1930’s was “Joaillerie Blanche,” or “white jewelry” – jewels set in platinum and white gold. Other jewelry houses did this as well. Though the style was born in 1929, it did not reach its height until 1935-1938 and was most popularly used in bracelets and brooches. In these pieces, the platinum was used as ornamentation and the mounting of the piece were no longer a hidden element or simple armature. The metal was worked into a planes and spiral forms, becoming a sculptural element of the piece and completing the composition. In the 1940’s, with the start of World War II, many of the great jewelry houses were forced to close. For the most part, Mauboussin , for reasons mentioned above, managed to hang on during the war, and began collaborating with René-Sim Lacaze from Van Cleef’s atelier, which was forced to close at the time. Many of Mauboussin’s designs were changed to avoid the high taxes placed on precious stones, using instead semi-precious stones such as aquamarines, citrines, and moonstones.Large gold pieces became popular, and Mauboussin’s finesse for working with gold shone in these pieces. Another trend in Mauboussin’s jewelry was the reemergence of flower and nature motifs, stylistically very different from the type popular in the 1920’s. These pieces were true representations of nature, rather than a pattern simplified to evoke the feeling of one. Briefly in the 1940’s during the occupation of France, Mauboussin had to close its doors, but reopened following the war to an exuberant nation. Mauboussin moved in 1946 to 20 Place Verdôme, a very rich and fashionable part of Paris, which it still is today. The new move brought about changes to the way Mauboussin did business, and brought about the creation of their Boutique jewelry. The Boutique pieces were less expensive and came in various lines such as “cascade”, “silhouette”, “Viking” and “cocktail”.Meanwhile, René-Sim Lacaze continued to create pieces for Mauboussin, designing tri-color collars and brooches in emerald, ruby and sapphire. Using an expanded palette with rose pearls, turquoise and coral added to the beauty of the bird pieces of the post-war period, which became extremely popular. 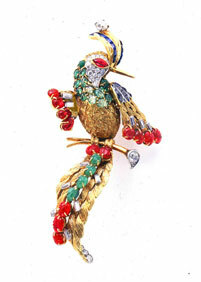 The birds were chosen based on their plumage and were replicated in gold and precious stones. The exquisite gold from the 1940’s was transformed in keeping with new styles. The polished surfaces were replaced by sculpted details on the body of the bird, which had disappeared during the stylizations of the 1920 – 40’s, and express the vitality of the animals. To quote Claude Verlinde – “for it to be translated into the language of beauty, the bird must be changed into a different bird, more bird than himself”. Mauboussins’s designs continued to evolve, reflecting the jewelry styles of the times, and they remain one of Paris’s fine jewelry houses. In the next few decades, Mauboussin expanded across the world, opening in Japan in the 1980’s and reopening on Madison Avenue in New York as recently as 2009, only 12 blocks away from their old location.